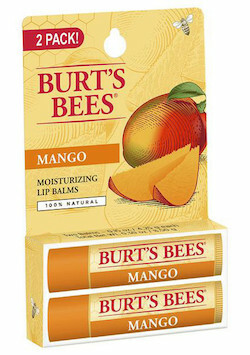 Made with mango butter, this nourishing balm smoothes and nourishes for happily hydrated lips. One taste of its fresh, fruity flavor and your lips will love you with a passion. Ingredients: Helianthus annuus (sunflower) seed oil, cocos nucifera (coconut) oil, cera alba (beeswax, cire d'abeille), aroma (flavor), ricinus communis (castor) seed oil, mangifera indica (mango) seed butter, llanolin, ammonium glycyrrhizinate, tocopherol, rosmarinus officinalis (rosemary) leaf extract, glycine soja (soybean) oil, canola oil (huile de colza), limonene, linalool. natural flavor.